"I have a lot of feelings. And you've managed to hurt almost every one of them." "Nope, send all these beams back to the lumberyard and send us good ones. FOHC only." 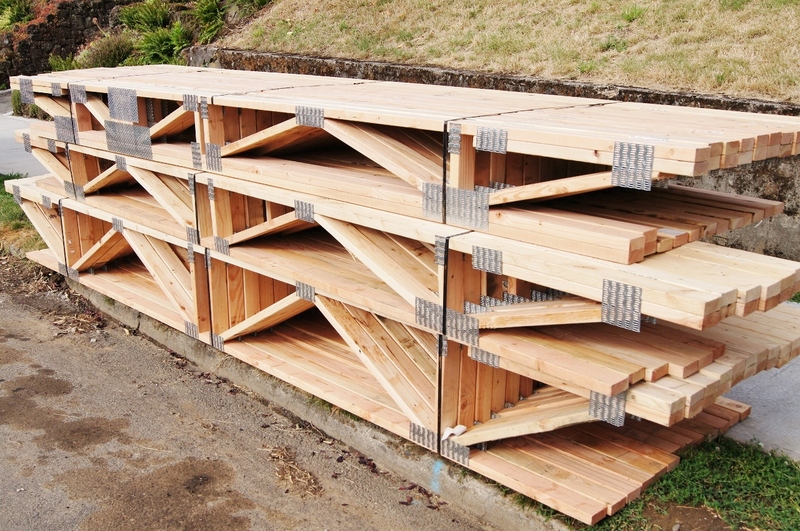 FOHC = Free Of Heart Center; meaning the beams should not contain the very center of the tree, because this will likely cause a lot of twisting wood movement with time and changes in moisture. The first walls on the house have gone up. Started with the tallest balloon-framed walls beside the stair, otherwise there would be no place to build them on the ground once the other walls are in place. 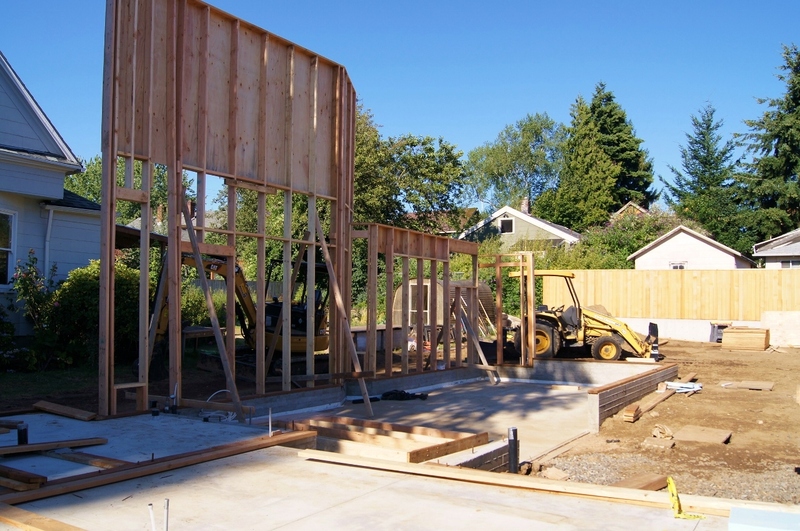 'Balloon framing' refers to walls that are built using continuous studs that span more than one floor. Since the stair is right up against this wall, almost the full height of the two-story wall is visible on the interior. Framing this way avoids a joint at the floor line, and makes a stronger wall. You'll notice that there is plywood attached to the upper part of the wall. 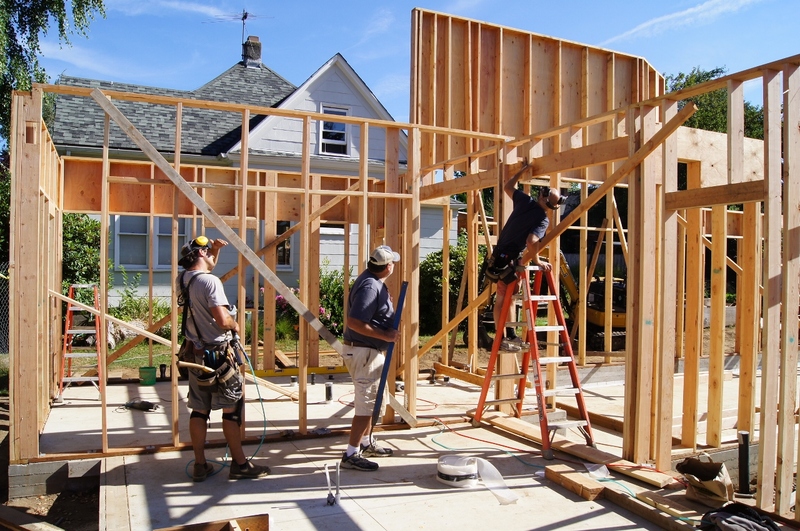 This is because it is easier to put the plywood in place when the wall is laying flat on the ground, than it is to carry sheets of plywood up a ladder. The plywood is only attached at the top, and when the wall is stood up and plumbed square, they nail it off. Truss on truss on truss action. The floor trusses have arrived. We don't quite have walls in place to put them on yet, but here they are. Window Mock-up - we decided to increase the steel fin projection 1" more than what is shown here. Sometimes we test our design assumptions by making mock-ups. If necessary, we might build a mockup as accurately as possible, using the actual materials and assembly. Often, however, just a bit of cardboard and tape is sufficient to show you what you need to see. This is a mockup of a window opening detail. 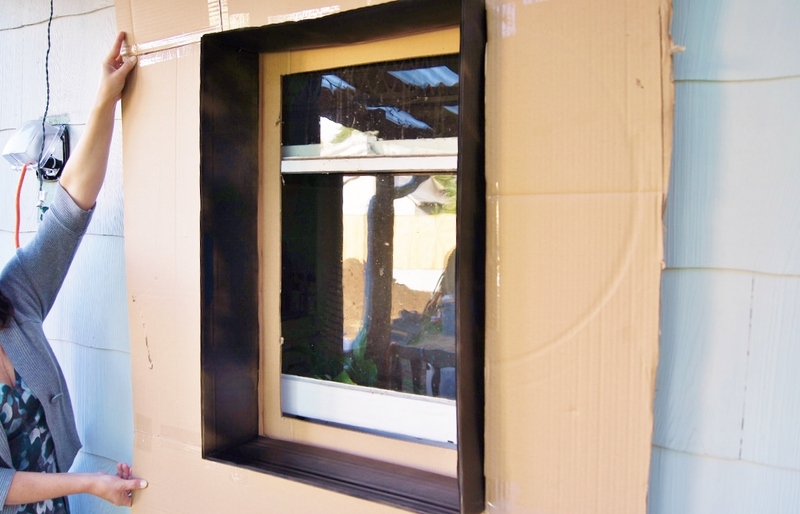 The cardboard is being held up against a window on our existing house, to help simulate the effect. A few days of rain - strong enough to chase the guys off site - and a concurrent project means that the schedule is slipping. 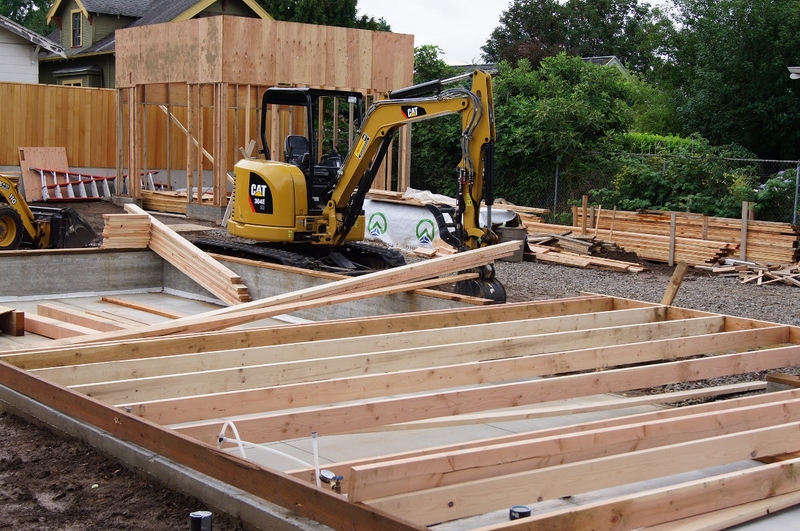 Framing is supposed to be ready for the first floor trusses tomorrow, but so far no walls are standing on the house. 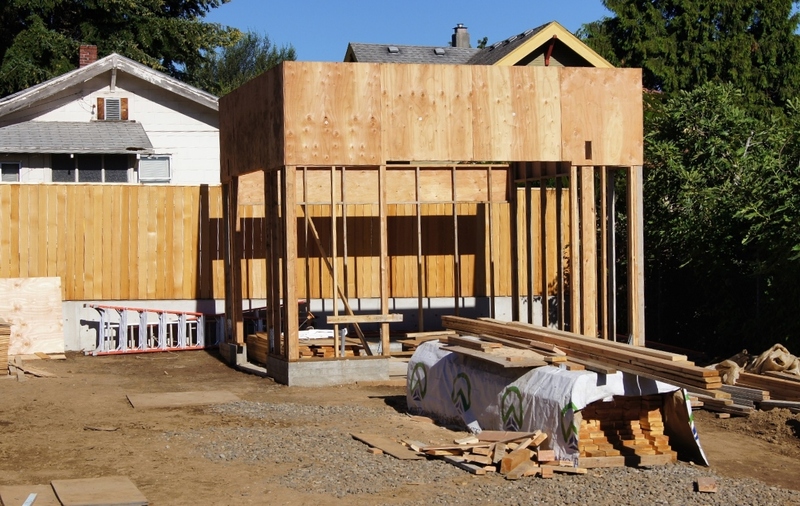 The very first wood framed wall on the project has been stood into place. It is the east wall of the Garage. The plywood sheathing was attached to the upper part of the wall so that they won't need to lift it into place on ladders later. 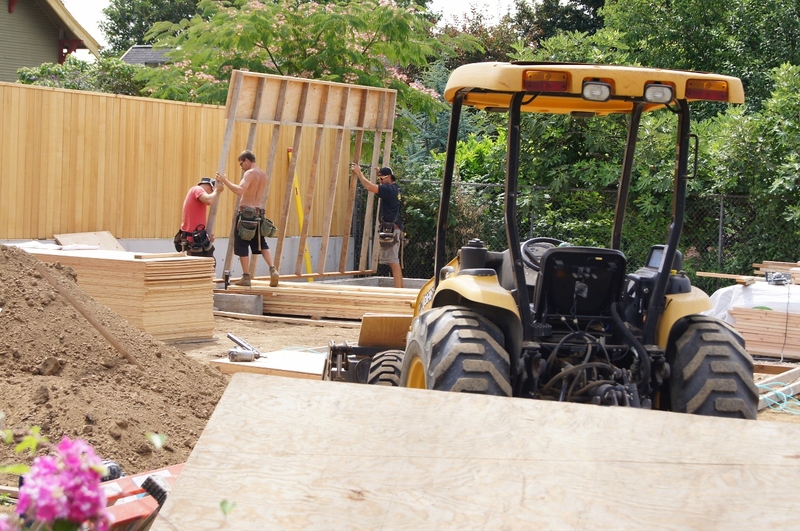 Framing for the main house is set to begin - the layout is complete and double-checked. 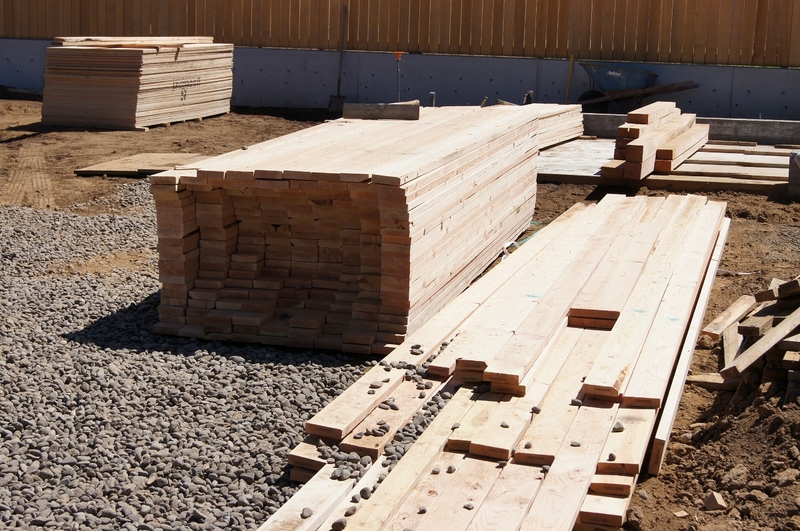 The lumber has arrived, and framing is underway. "Plausible deniability is not a phrase you want to be hearing on your jobsite." 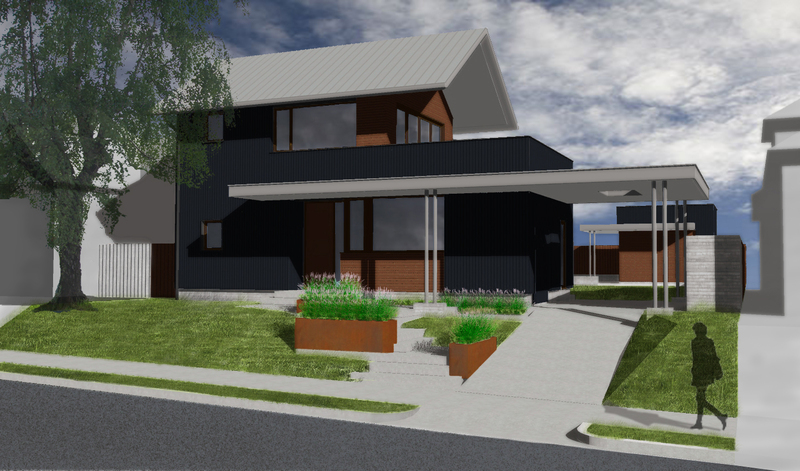 It is certainly about time we show you the building's appearance. Dirt piles hide the deep trenches. On the slab you can see the saw-cut control joints, and the blotchy drying out of the slab. (It won't look like that in the end). The site was so neatly graded and clean for the 4th of July weekend. The decision was made to delay framing for the time being, and to get much of the remaining sub-grade piping into place. This means trenches everywhere. Oooh! A dry spot! Get the hose! Our neighbors probably think we have a screw loose. 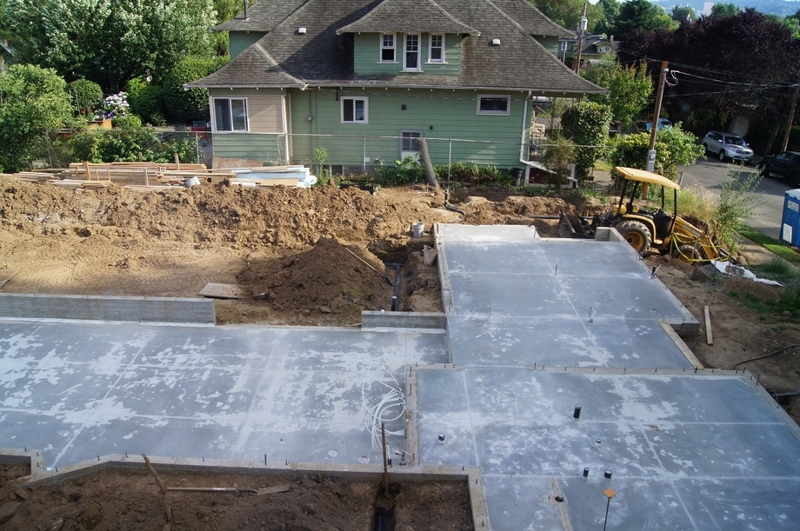 We have been watering our concrete slab day and night for a week. "How was the futsal game last Friday?" Lisa & I completed the new fence on our East property line this weekend. 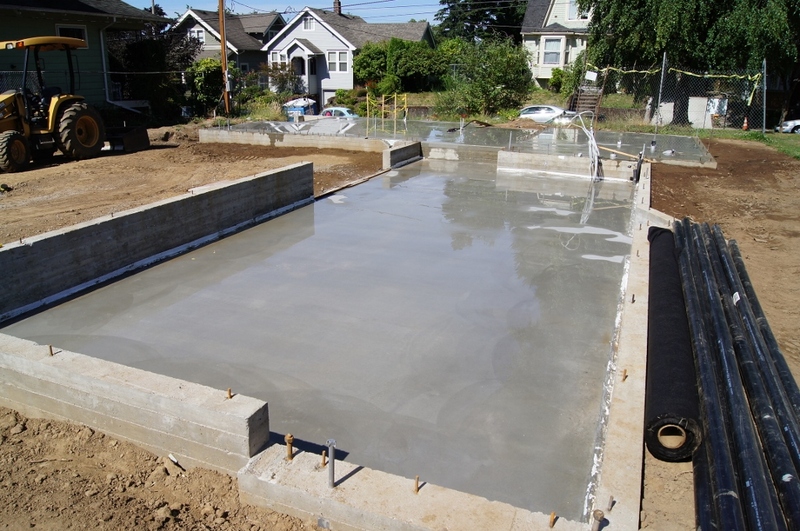 The concrete pour for the house slabs went down today. Looking good! Got a very early start to beat the heat. Slab was down and set enough to spray with water before the heat arrived.